This Butter Cookie Recipe is the best recipe for cutout cookies and decorating with royal icing. Butter cookies are softer than a sugar cookie, but not as soft and crumbly as shortbread, making them the perfect cookie for decorating for the holidays! Between its ability to hold its shape, bake beautifully, and its delicious flavor, this butter cookie recipe has been a favorite in our family for decades. Last weekend we had our second Drop In and Decorate Party! What is Drop In and Decorate? It’s a cookies-for-donation program. You invite friends and family together to decorate cookies, then donate them to your favorite people, charity or organization. These cookies were bagged in sixes and were delivered this morning to The Agape Food Pantry. This time Heather and a couple of her friends came to help!! LET’S MAKE THE BEST BUTTER COOKIE RECIPE AND DECORATE! Of course, we made our favorite cutout butter cookie recipe (from my sister-in-law) and had a blast decorating the cookies with royal icing and sprinkles! TIP: We used the Wilton Cookie Exchange book for cookie decorating inspiration. One batch of icing (3 cups) is enough for one batch of the recipe I have shared below. 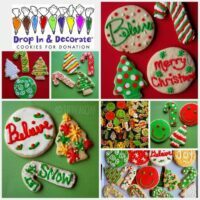 Bridget has great tips for royal icing and icing bags, I highly suggest you read if you are new to decorating with royal icing. 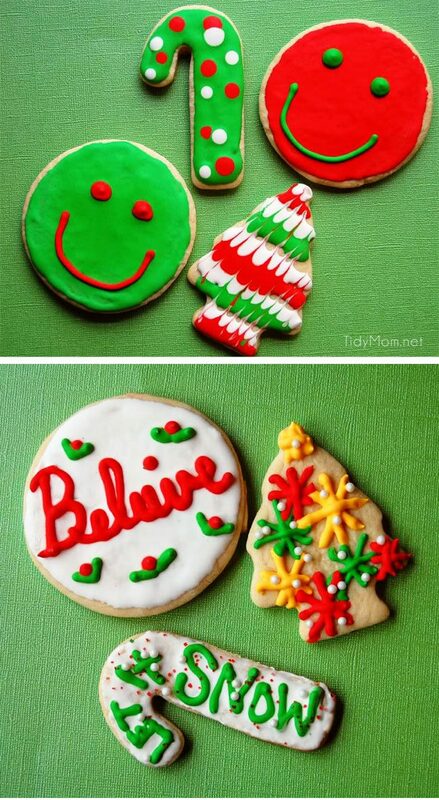 You can also check out more of my decorated cookies for more tips, tricks, and pictures. Did you know that you can bake your cutout butter cookies and freeze them, and decorate later?! Yep! it’s a great way to make holiday cookies without being overwhelmed! Need more help with cookies? Get my cookie baking tips and cookie baking secrets!! LIKE THIS BUTTER COOKIE RECIPE? PIN IT! Butter cookies are softer than a sugar cookie, but not as soft and crumbly as shortbread, making them the perfect cookie for decorating for the holidays! Using a large bowl with an electric mixer, cream butter and sugar. Add egg, milk, and vanilla and continue mixing until well combined. Whisk baking powder, salt, and flour in another large bowl. Add flour mixture to wet ingredients, 1 cup at a time. Mix until combined before adding each additional cup of flour. Divide dough in half and form 2 large balls. Cover each ball of dough in plastic wrap and place in refrigerator to chill at least 1 hour or overnight. Preheat oven to 400° F. Working with 1 dough ball at a time, roll out dough on floured surface (I like to use powdered sugar to flour my surface for cookies) 1/4 to 1/2 inch thick. Cut into shapes with cookie cutter. Place cookies 1 inch apart on ungreased cookie sheets. Bake 5-8 mins (the large cookies I do for 9 mins) in preheated oven. Cool completely before decorating as desired with royal icing. Drop In & Decorate cookies-for-donation program first started in November 2007. While the program is no longer in existence, you can click here to see all of my Drop In and Decorate posts. Cheryl…these pictues are WONDERFUL!!! I'm so glad that I am tardy getting my DI&D post up so I can use more of your pics! You're amazing! These cookies look great! You're so talented. 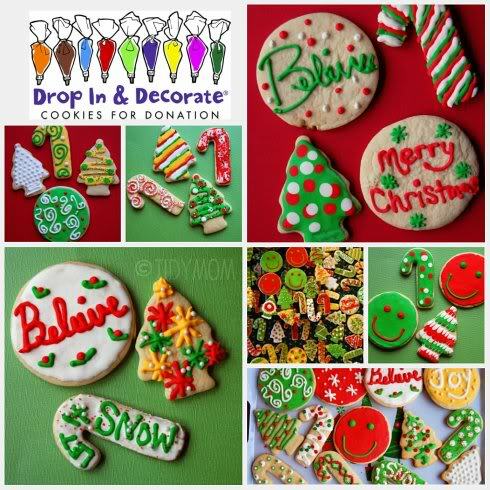 I've been using recipe sites like http://www.tablespoon.com to find ideas for decorating cookies. I love the "drop in and decorate idea". Did the guests take home a bag too? I have to do this next year! Way to go… there is a TON of cookies there!! You guys must have been baking and decorating for DAYS!! And how cute are you?? Very! That's all so cute I can barely contain my excitement! Sooooo many cookies….just makes me swooooon with warmth! I am just overwhelmed with YOU! Cherly you are the COOKIE BOMB! What a lovely time you all must have had! Did you post once on a hot chocolate maker? I so want to get my niece one. I remember you liking yours…could you share what kind? Oh…and you know I'm not a BEGGER…but I soooooo want to share my Christmas Cookies with you and Bridget. Did you take a look at them? So sorrrrry to sound like a hungry begger for you attention! Ha! I just know how much of a cookie lover you are…like me! You've completely impressed me AGAIN! 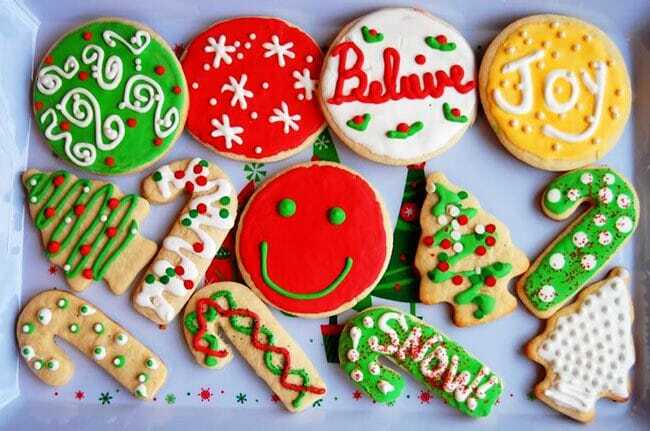 I am in awe of how you make this MASS amount of cookies YET they are each amazingly decorated, every single one! Great work! I have never seen so many yummy looking cookies! The recipe you shared looks easy enough too so I will have to give it a go. Thanks so much for visiting my non-cookie post! I like the sound of these. And they look so cute and colorful! Ted (a Drop In board member). Thanks Cheryl, for hosting the last day of the fantastic Holiday Christmas Bash. 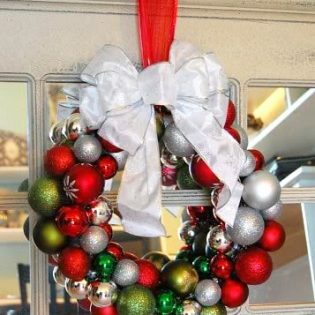 I love your blog and especially loved your post on Christmas traditions. I share alot of the same traditions as you. I'm a follower! Thanks for the butter cookie recipe, I use the Wilton one, and yes, also use salted butter. Why use unsalted (costs more) and add salt? I don't get it. Do you load up that Wilton royal icing recipe with vanilla? And I mean, LOAD IT UP?? Wow, wow wow wow! What an awesome array of (lots of) cookies! Such a great idea too. I just 'discovered' your blog and am charmed (and sucked in) lol 🙂 Your beautiful family, informative posts, your adorable pooch… So glad to find you! The butter cookies are very good but the icing ruined the cookies. The icing gets very hard and doesn’t have much Taste. They were better before I put the icing on them. I colored it different colors so they look pretty but that s about it. I doubt they will be a hit in our family. Royal icing is supposed to be hard and doesn’t have a whole lot of flavor – did you put any flavoring in it? I usually put a little vanilla and a little almond extracts. These cookies look and sound delicious! I amnre new to baking and am wondering if i should let these begin to brown around the edges. Can’t wait to make them! PS. These will be going to a veterans dinner and I want to be sure they are baked correctly. I am wondering if I should let these start to get golden around the bottom edges at all. Your cookies look delicious! Thank you. no, they will not be golden around the edges 🙂 Enjoy!! Thank you. I am just learning to bake so how will I know when they are done? Sorry to be a bother! no bother at all!!!! enjoy! !